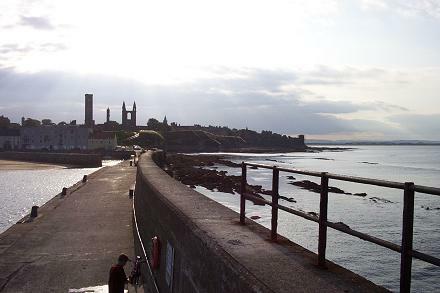 View of the Royal and Ancient town of St Andrews, taken from the pier. Having spoken on the telephone this morning with the Unit Director of Business Improvements at the University of St Andrews, I now have a start date for my new job: Monday 1 May 2006. I would have wanted to start much sooner than that, and so would they. Had we not been approaching Lent and Easter, and had I not have been covering at St Ninian’s, Comely Bank, and had I not been committed to getting as much of the Scottish Episcopal Church website done before I my appointment ended at the end of April then I would have said that I could. But I felt that I wanted to see my commitments here through to the end. It’s now beginning to sink in that I got the job. I’m really getting quite excited about this new post, in what is a fairly new discipline — most people I speak with ask me “What is an Information Architect? !” I’ll explain that in a well-structured post soon, but if you can’t wait there is an article about Information Architecture on Wikipedia. So, a few people have asked me about the interview on Wednesday. 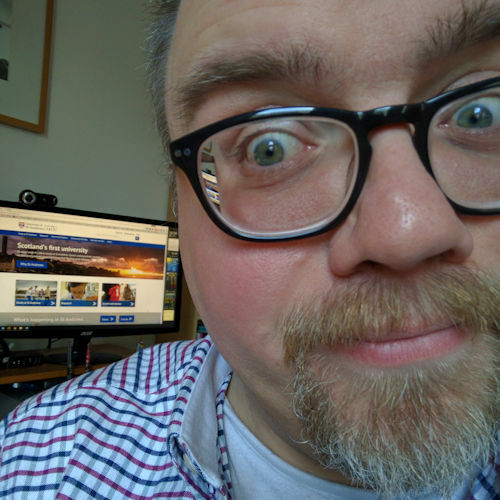 Before I write about that I’ll just say a quick, presumptious hello to any members of the Business Improvements Unit who now may be following my blog with interest. Here’s how it was from my perspective. As it happened my interview date coincided with my good friend Peter Leeming visiting from Aberdeen. I was at St Mary’s College with Peter from 1989-1993 and we’ve remained firm friends ever since. In fact, Peter is the only person I remember from my open day visit to St Mary’s and I remember thinking how clever he must be while we visited the main library because when the group were asked for the name of a theologian he suggested “Karl Barth”; I’d never heard of him — Bart Simpson, yes; Karl Barth, no. Anyway, kindly Peter offered to change his plans for the day and travel up to St Andrews with me; I took him up on his offer. The first part of the interview consisted of a two-part written task. Part one was to write out — on paper, with a pen — the HTML code for a web page. On the way home Peter asked me why, given that St Andrews is The Finest Academic Institution in Scotland™, they do all their Web coding on paper! It took me ages. I only had 30 minutes for both tasks, and writing out HTML in long-hand took me about 20 of those. Give me a PC and a copy of Notepad and I’ll tap it out in about a quarter of that time. Give me a PC and a copy of WeBuilder 2005 and I’ll do it in 2 minutes! Which is partly why I found the final cell of yesterday’s Dilbert cartoon so funny. The second task I ran out of time for, but managed to scribble some ideas down. Scribble being the operative word. I’d forgotten just how much I rely on my PC for writing and organising my thoughts. I write, edit and re-edit, which is fine on a PC because the delete key doesn’t leave the same trail of squiggles and cross-outs that I left on that sheet of A4. On reflection I should just have been bold and used a mind map. Time up, I was accompanied to another building for the interview itself. What I remember most about the interview room itself, apart from the three people who interviewed me were the blue sofas complete with University of St Andrews crest embroidered on them. The interview I guess went well, because I got the job. But I remember coming out of the building afterwards thinking “Aww… I’m sure I’ve blown that!” I was still feeling quite washed-out having had that 24 hour bug the day before, and so wasn’t entirely myself, but the three who interview me welcomed me warmly and helped me to relax as much as I could. I enjoyed delivering my PowerPoint presentation, with not a bullet-point to be seen, almost as much as I enjoyed writing it. When we gathered back around the table — which felt good that we were around the table rather than a ‘them vs me’ arrangement across the table — I struggled a bit with getting out what I wanted to say. It was like there was so much information that I wanted to share it was hard to get it all out coherently. There was one point where I misunderstood — or misheard — the question and tried to explain the difference between XHTML and XML when I’d in fact been asked to differentiate XHTML from HTML. D’oh! Still, despite my fearful response after leaving the interview room, I had enjoyed the meeting. But then, what isn’t there to enjoy about meeting new people and talking about a field that I have a passion for? After an enjoyable lunch at PizzaExpress — I had the Pollo con Funghi, thanks for asking — we drove back down the road to Edinburgh. Reaching Kirkcaldy at about 16:40 I realised that I was very near my brother Eddie’s new place of work. He now works as a Health and Safety Officer for Fife Council, seconded to their Fire and Rescue Service. I gave Eddie a quick call and went to pick him up. Shortly after passing Thornton railway station on the way back my mobile phone rang. I threw it to Eddie on the back seat who answered it chearfully. Checking the rearview mirror I stepped on the brake and parked at the side of a long, straight road, with the hazard lights on and took the phone back from Eddie. This is it, I thought, thanks but I’m sorry you were unsuccessful. But to my absolute delight (and pleasant surprise) I was wrong: I was the successful candidate. We arranged that Heidi would telephone me on Friday morning to arrange a start date and salary and then she checked that my contact details were right. Heidi: Would it be easier to phone you on your landline or mobile on Friday? Gareth: Either is fine. I should be in, though. Heidi: Alright, I’ll telephone you on Friday. Gareth: Have you got my mobile number? Heidi: I’m phoning you on it right now. Gareth: [Slightly embarrassed pause.] Oh yes. Well noticed! Meanwhile Peter and Eddie were killing themselves laughing, quietly in the background. I hung up the phone and turned to them, “I got the job,” I said simply. For the next couple of miles down the A92 whenever I looked in my rearview mirror all I could see was Eddie smiling wildly, his face held between two hands giving me the thumbs-up. And that was it — or at least part of it, the rest I’ll keep to myself to treasure if you don’t mind. I feel a new sense of confidence about myself. And I have no doubts that this is the area I want to work in. Because even though there is a good helping of geeky stuff in this field and this job, at the end of the day it’s still all about caring about people: presenting information in such a way that anybody can access or update it easily and simply. Because if it’s not arranged in a user-friendly way, if it’s not organised in a way that people can find it it might as well not be there at all. Put another way, what is the point of hiding your light under a bushel? As someone famous once said (Matthew 5: 15). I also share in your proudness. Nice thorough description of the events, was I there? I feel like I was. Really really well done, I’m so pleased for you.